The Vegan Edge with Stacy Alexander: My take on flax seed and a Pina Colada Smoothie recipe! My take on flax seed and a Pina Colada Smoothie recipe! When my husband and I took a vegan nutrition course a few years ago, the benefits of flax seeds couldn't have been emphasized more. What a lot of people don't realize, according to our instructor, is how quickly the flax seed oil deteriorates. She recommended that rather than purchase expensive flax seed oil in liquid or capsule form, we should simply buy the inexpensive raw flax seeds that are sold in the bulk produce section of most natural foods stores. Using a coffee grinder, we were told to grind a week's worth (according to recommended dosages for our body weight and height) and to keep these in an airtight container in the freezer. The flax seed has its own protective coating and if you fail to grind it up prior to ingestion, it will simply pass through your body without bestowing any of its many health benefits. The nutrients in flax seeds also weaken when they're heated, so buying hot cereal that has flax seed in it is kind of a moot point. Sprinkle them on your cold cereal or stir them into your yoghurt. You can also put them in smoothies or juice. The seeds can be stored in a plastic bag at room temperature or in a glass jar or other airtight container for up to several months as long as they are not ground. After they are ground, into the freezer they should go. 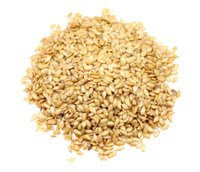 Flax seeds are most sought after because of their high content of alpha linolenic acids. Alpha linolenic acid is a type of plant-derived omega 3 fatty acid, similar to those found in fish such as salmon. Benefits of flax seed as shown in many studies include lowering total cholesterol and LDL cholesterol (the Bad cholesterol) levels. Other benefits show that flax seed may also help lower blood triglyceride and blood pressure. It may also keep platelets from becoming sticky therefore reducing the risk of a heart attack. I found that an added benefit is that my hair gets nice and shiny when I take flax seeds on a regular basis, and that my nails are strong and skin clearer. Aside from alpha linolenic acid, flax seed is rich in lignan. Lignan is a type phytoestrogen (antioxidant) and also provides fiber. Researches reveal that lignan in flax seed shows a lot of promise in fighting disease -- including a possible role in cancer prevention especially breast cancer. It is thought that lignan metabolites can bind to estrogen receptors, hence inhibiting the onset of estrogen-stimulated breast cancer. Recent studies also showed positive benefits of flax seed oil in IBD (Crohn's Disease and Colitis). Flax seed oil seems to be able to heal the inner lining of the inflamed intestines. Nothing in this blog is medical advice, ok? If you're sick...see a doc. Blend until ice is slush-like. Add more almond milk if mixture is too thick. Pour into chilled glass and enjoy! Ahhhhhh!